In 60 secs: Who are al-Shabab? 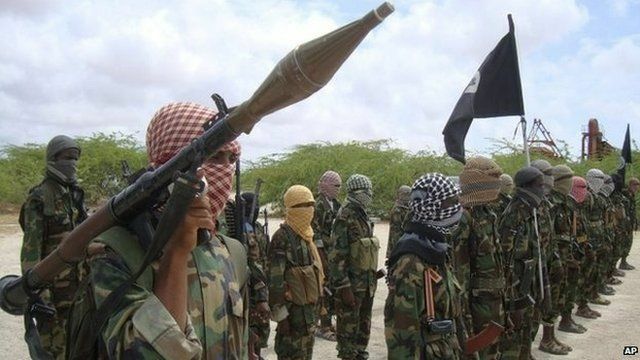 Jump to media player Islamist militants al-Shabab are battling the UN-backed government in Somalia, and have claimed responsibility for attacks in neighbouring Kenya. Who are al-Shabab and what do they want? How strong is Iraq's army? Jump to media player Iraq's army is battling an jihadist insurgency - but how strong is the force? Why is Mosul important? In 60 secs Jump to media player A 60-second look at the strategic significance of Mosul, and what its fall to Jihadist militants means for the government of PM Nouri Maliki. Precedents for Karachi 'spectacular' Jump to media player A 60-second look back at precedents for the attack on Pakistan's largest airport, which killed at least 28 people, including all 10 attackers. 60 secs: MH370 'terrorism unlikely' Jump to media player Theories abound about what might have happened to missing Malaysia Airlines flight MH370, but BBC News outlines why a terrorist attack is unlikely. Nigeria's challenges - in 60 seconds Jump to media player BBC News looks at the challenges facing Nigeria President Goodluck Jonathan, in 60 seconds. Turkey's worst mine disaster - in 45 seconds Jump to media player BBC News gives an update on the mine disaster in Turkey - in 45 seconds. In 60 secs: Thailand's military coup Jump to media player What you need to know about the coup in Thailand - in one minute. Why is King Juan Carlos abdicating? Jump to media player King Juan Carlos of Spain is abdicating after nearly 40 years on the throne; BBC News asks why - in 60 seconds. What happened at Tiananmen? Jump to media player A 60-second look back at what led to the Tiananmen massacre, when hundreds of people died as Chinese authorities cracked down on pro-democracy protests in 1989. In 60 seconds: Who are al-Shabab? Al-Shabab Islamist militants are battling the UN-backed government in Somalia, and are suspected of links to a string of attacks in neighbouring Kenya. Here's all you need to know about al-Shabab - in 60 seconds. Video produced by Michael Hirst. Go to next video: How strong is Iraq's army?